The contacts that your business has developed over the years are a precious asset, but it’s important that you don’t sit on your laurels, as new business is essential for the long-term success of your enterprise. Networking can be a highly effective means of gaining new contacts that could develop into lucrative contracts at a later stage. Business owners often see networking as little more than a gimmick. As many small business owners work alone, or within small tightly knit groups, the thought of approach a stranger is a very stressful experience. Remember that networking doesn’t have to mean attending large networking events at your local business support centre. Networking can also be highly effective over the phone or even via email. The Internet of course has radically altered how networking events are organised and hosted. Finding a local networking organisation is now child’s play, but your first port of call should still be your local business support organisations as they will either host their own events, or can advise you about when and where the next networking event is taking place. Networking tends to work best at local level where businesses have at least their geographical location in common. You can find your local networking events by calling your chamber of commerce. How you approach a networking event is also very important. Business people that see networking simply as another sales channel often comment that they didn’t get as much out of the event as they had hoped (i.e. a sale). Yes, networking events can produce real orders, but approaching a networking event as nothing more than a sales pitch is a recipe for disaster. Networking events are about more than just sales. The contacts you make on the day, could result in an order months or even years into the future, so approach the networking events you attend with an open mind. Networking events can be like speaking in public. If you haven’t done this before practice what you want to say when people at the event ask you about your business. 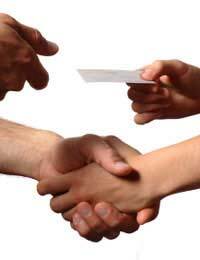 Your business card is an essential component of a successful networking event. Don’t even think about attending an event without a pocket full of business cards. As you may not know anyone at the networking event you’re attending listen to what they have to say. Remember the event is not just about you trying to sell your business’s services or products. You’re also developing relationships. If you hit it off with a number of attendees you’re bound to want to exchange more information than just a business card. Take a small pen and pad with you so you can make some notes, or invest in a Dictaphone. Don’t rely on your memory. Use the information you have gathered at the event and follow up every lead you have gained. It’s important to do this soon after the event. Don’t forget there could be hundreds of people at your event, so refreshing the memory of a potential customer is very important. How you come across to the other people at the networking event will have a huge bearing on their perception of you as a person and by extension your business. Smile and always try and be enthusiastic about your business and the enterprises that people are talking to you about. Looking and sounding bored is the best way to waste the time and effort you have put into the networking event you’re attending.